Acidity or Alkalinity (pH) and material chemical composition. As caustic and acidic fluids can degrade pumps through corrosion, the fluid chemistry must be considered when selecting pumps materials. Operating Temperature: - In cases where the pumped fluids may be hotter than 200 Father pump materials must be evaluated for expansion. Mechanical seal components and pump packing integrity. 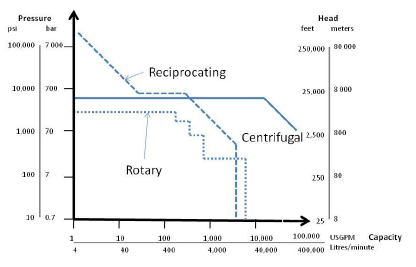 Solid Concentration/Particle Sizes: - Selecting a pump that will not clog or fail prematurely when pumping abrasive liquids such as industrial slurries needs to be evaluated. Principal factors include particle size and hardness, as well as the volumetric percentage of solids. Specific Gravity: - Specific gravity affects the energy necessary to raise and transport the fluid. It needs to be factored when formulating pump power requirements. The fluids specific gravity is the ratio of the fluid density to that of water under specified temperature and pressure conditions. Vapour Pressure: - Proper consideration of the fluids vapour pressure will assist to diminish the risk of caviation. Vapour pressure of fluid increases non-linearly with temperature. Viscosity: - Viscosity of a fluid is a measurement of its opposition to motion. High viscosity fluids results in decreased centrifugal pump performance and increased power requirements. Kinetic viscosity varies directly with temperature. 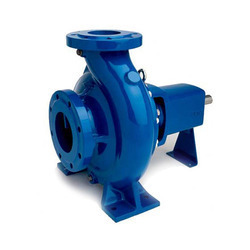 · Design Pump Capacity: -The design pump capacity must be sufficient to meet the required process flow conditions in gallons per minute(GPM) at a certain head pressure. The piping scheme is also needed to accurately establish friction head losses, build a system pressure-flow characteristic curve and decide on a suitable pump and drive motor. · End-Use Process Requirements: - The end-use process requirements may be fulfilled if the pump supplies a constant flow rate or variable speed drive to supply variable flow rate. The choice of flow control method may effect system efficiency. · Total System Head: - It is comprised of elevation. Static head and velocity. The static head is the pressure of fluid in the system. Dynamic head is the pressure required by system to overcome head losses caused by resistance to flow in pipes, fittings and mechanical valve equipment’s. Keep in mind that Dynamic head losses are roughly proportional to the square of the fluid flow velocity. Environmental factors that influence pump characteristic and behavior include ambient temperature and humidity, operating altitude, atmospheric pressure and whether the pump is to be installed inside a building or outdoors.